United Kingdom Study Tour 2006. The historical settlement of Australia took place in the context of the Industrial Revolution in the UK. To understand colonial settlement and industry, it is necessary to be familiar with this background. In 2006 Ted Higginbotham took the opportunity to visit a broad range of historical and industrial sites in the UK. Cornwall and West Devon Mining Landscape (WH). Working Cornish Engine Houses at Camborne and Levant, Cornwall (NT). Blaenavon Ironworks, S. Wales (WH). Gladstone Pottery, The Potteries, Staffs. Manchester Museum of Science and Industry. See Industrial archaeology. Weald and Downland Museum, W. Sussex. 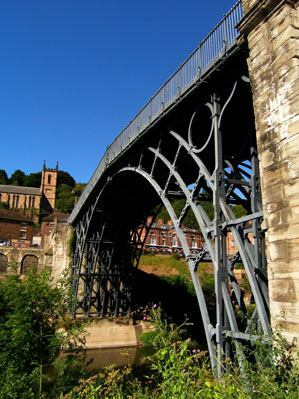 built in 1779, lies at the heart of Ironbridge Museum.